I was there in October and the weather was still over 90 degrees (30 C) making this an excellent winter sun choice for those of us from less sunny climes. The White Stallion Ranch was originally going to be called the Black Stallion ranch, but no one wanted to be stuck with those BS initials, so it became a horse of a different colour. There are a wide range of trusty steeds to choose from on the ranch to suit every different ability, from the complete novice to the accomplished equestrian. There are slow rides and fun fast rides, which have lots of cantering through the cacti on the menu. The horses are pretty much bombproof and sensible enough to deal with a wide variety of passengers. The ranch prides itself on not having a weight limit for guests and there are some real gentle giants here. I went out a couple of times with Big Bill, who is crossed with a draft horse, leading the ride. White Stallion wranglers are really friendly and helpful and make guests feel immediately at ease, which is extremely important. They need to be people people, as well as horse people. 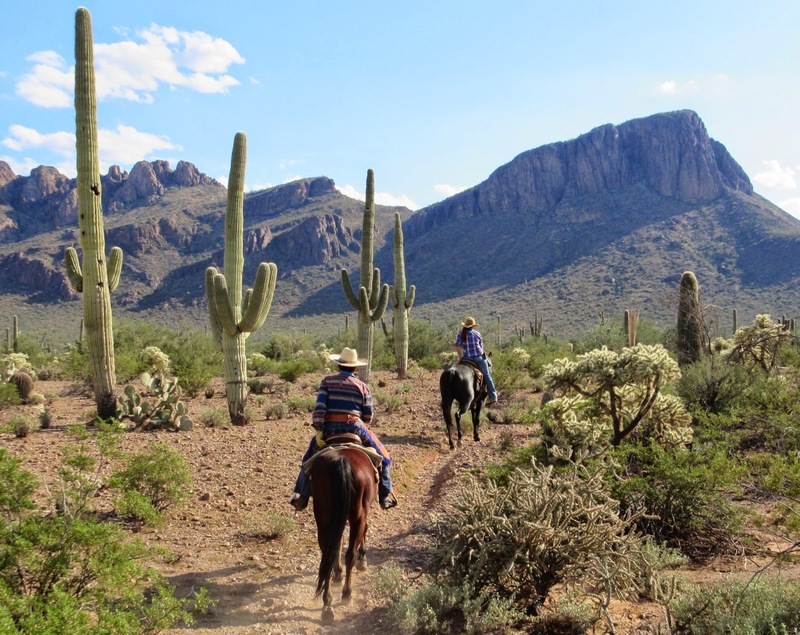 There are desert rides and mountain rides, and the chance to round up and pen cows (small ones) in teams with other riders as if you were a real cowboy. You can even practise your roping skills with a few easy targets. Everyone is welcome here at the ranch. There are families, couples and single guests here who all get along just fine. Ranch holidays are great for single people because you have an instant horsey family you can join and something in common from the get go. This ranch is open year round, unlike many, and the climate is so warm here pretty much all the time, that most meals are taken ranch style out in the open air and you will definitely not go hungry. Evening entertainment is also part of the package and varied from the singing cowboy (my favourite song was Rawhide) to line dancing, to star gazing through a telescope – something you can’t really do at home under our cloudy skies. The scenery around the ranch is pretty stunning desert terrain with mountains and huge Saguaro cacti everywhere. These giant spiky features of the Western landscape are a protected species and very slow growing. They have to be seventy five to eighty years old before they grow their first ‘arms’ and some of these plants are hundreds of years old. Legend has it that each cactus represents a dead Indian and the number of arms it has represents the number of wives he had. An interesting theory. One of the other fascinating features of the White Stallion Ranch is its place in movie history. It has featured in a plethora of TV and movie credits including the 1939 blockbuster Arizona starring William Holden and numerous episodes of the High Chaparral, which was one of my Grandmother’s favourite series. Ronald Reagan led the Confederate Cavalry against the Apaches in The last Outpost (1951) against the backdrop of the ranch’s Safford and Panther Peaks. If you feel you need a change from horse play you can even have a go at rock climbing on the 3000 acre ranch which has plenty of rocks to choose from. Don’t look down, don’t look down..
Our instructor, Wade, told me to look out for scorpions and rattlesnakes which is always a comforting thought, before I faced the rather daunting prospect of scaling a vertical wall armed only with a robust fear of heights. I really didn’t think I’d be able to haul myself up there, but with Wade’s encouragement and using my tendency towards stubbornness to my advantage, I made it to the top of the first climb and then amazingly, the harder second one. Although I can confirm that rock climbing and fingernails do not mix I was still pretty proud of myself. The White Stallion Ranch is now one of only a handful of guest ranches in the area, where once there were about a hundred. 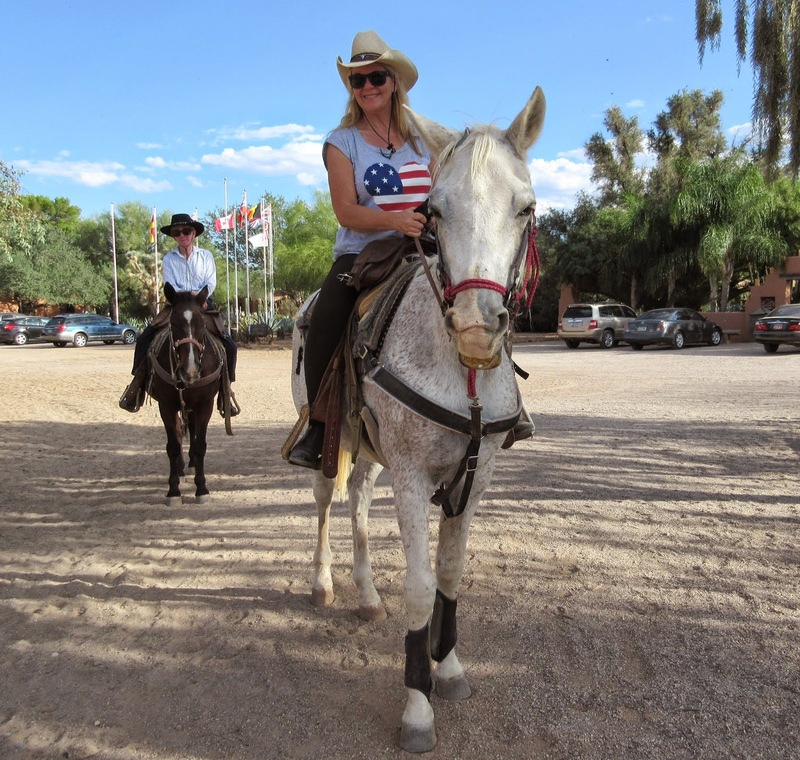 The growth of urban Tucson has put pressure on these family businesses and this makes the White Stallion a real labour of love and an extra special destination. The White Stallion ranch has never been more popular, and has welcomed visitors from every state in the US as well from 53 other countries. Russell True summed up the ranch’s success story when he said “You need a good system, great wranglers and good equipment, but if you’ve got the wrong horse, you got nothin’ ” Exactly! The ranches is the place to plan a holiday tour to make your holiday more memorable.